The Double Ginkgo 2x2 tile is available in a choice of glazes; all are non-toxic and lead free. Every tile is made to order. Most orders ship in 30 days or less. 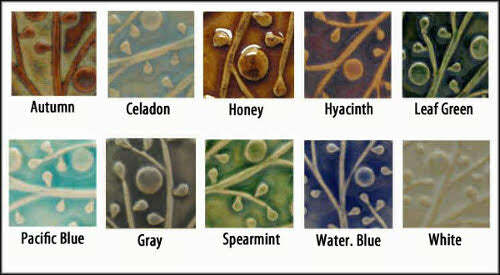 This tile can be used in a permanent installation, or displayed in other ways, hung by hook, or in an easel. Each tile made is handcrafted individually, using traditional methods. The high fired stoneware is sturdy enough for many applications. .